For his first solo exhibition in Western Canada, Michel de Broin presents recent work in various media. His art may take many forms, from traditional sculpture to installations, actions, and video, but it always employs a rupture in the logic of a particular convention, whether it is an object, situation, or process. Perversions, detours, and odd juxtapositions are strategies that repeatedly appear in his work, which uses the combination of unrelated systems in order to expose overlooked preconceptions. De Broin is concerned with the issue of ‘resistance’, a working concept that often uses physical systems as metaphors for larger power structures. For de Broin, ‘power’ can be simultaneously conceived in terms of a political imbalance as well as brute energy. The forces of desire and idiosyncrasy are used to short-circuit the flows of power to produce solutions for unasked questions, an immediately obsolete mode of production that addresses existential human needs rather than serving a relentless consumer culture. For example, in Keep on Smoking II (2006-2009), a bicycle was modified so that the cyclist produces the energy required to power a machine that releases thick smoke through an exhaust pipe. The harmless yet unexpected smoke from this bike creates a ‘reverse’ discourse that frames issues such as fuel consumption, ecology, and bio-power in a humorous and delightful way. Shelter III (2009), is a work constructed from ten tables joined together around a central void. Here de Broin turns an object normally associated with production, display, and communal interaction into a construct for the intimate and the secret. Bleed to death (2009) is an impossible object that continues de Broin’s subversion of everyday devices and tools. In this work, it seems as if a power drill has pierced itself, producing holes from which water springs. Produced specifically for the Plug In exhibition, Décolonnisation I, II, III (2009), is a triptych of oil on canvas that concerns the particular quality of the Plug In exhibition space. 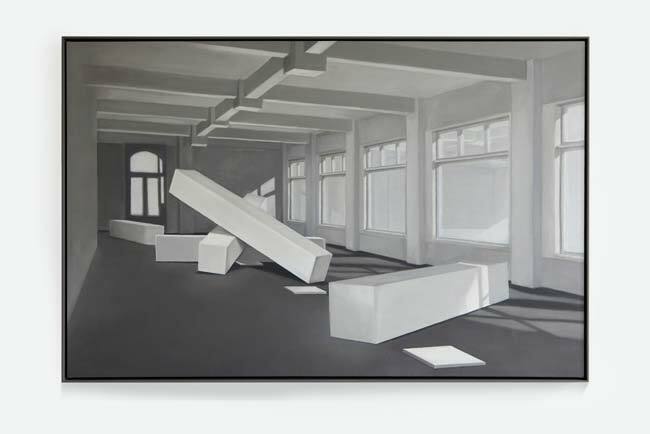 DeBroin uses painting as a means to re-arrange the architectural elements of the gallery, presenting the unavoidable but usually overlooked columns in the space as fallen elements of a picturesque composition. Like Bleed to death, the work can be seen as a critique and perversion of a typical symbol of virility, and serves to concentrate the overall strategy of negation that is evident in the exhibition. There is an enigmatic cohesion to Disruption from within that not only makes it a highly aesthetic and compelling collection, but also allows everyday objects, and in turn everyday life, to achieve an almost mytho-poetic status. De Broin’s ‘negative’ strategy is also evident in another new project specifically conceived for Winnipeg at Le Jardin de sculptures, at La Maison des artistes visuals francophones in St. Boniface. To be inaugurated on the 17th of September, Monument is an uncompromising extension of de Broin’s concerns into new territory and a real coup for Winnipeg. Inspired by the characteristic snow that blankets the city in winter, and influenced by the sense of mystery and poignant obfuscation in the work of Guy Maddin, Monument uses traditional sculptural motifs in an unprecedented way. The work, which is composed of two veiled figures sculpted in granite, acts on the visitor at a level beyond representation, opening a space between individual identity and human anonymity, between public and private, and between forms of visibility.